The healing power of inviting yourself into someone’s pain. A number of years ago when my oldest was getting ready to leave for college, my youngest, who had shared her room since she was born, was counting down the days of her departure. She was going to be moving into Natalie’s room–finally having a room of her own. Natalie was barely out the door when Stephanie had her stuff moved in. She was excited to say the least! And I was happy for her. However, she was only in her “own” room a short six months when her sister, Anna, became ill over what would become a seven-year medical crisis. I’ll never forget the day Anna came home from the hospital after her first surgery. When we were finally able to move her upstairs to her bedroom, there was Stephanie. To my surprise, Stephanie moved her stuff back into her old room and slept next to Anna–not leaving her side, for the next three years! It was something I never suggested. Unknowingly, Stephanie epitomized what we are instructed to do in Galatians 6:2, “Carry each other’s burdens, and in this way you will fulfill the law of Christ.” The New American Standard version uses the word “bear.” It’s the act of “having sympathy, feeling for each other and considering the case of a distressed brother as your own” (Clarke’s Commentary on the Bible). While I’m not sure that, at nine, Stephanie technically understood what burden-bearing was all about, she instinctually did. She was so obviously “considering the case of her distressed sister as her own.” I believe God places that sympathy, that awareness in the heart of every believer. From the beginning He knew we wouldn’t survive in isolation and that we would need each other, sometimes desperately so. This was one of those “desperately-so” times. There were no words to make Anna’s burden better or lighter, but there was incredible comfort in someone else coming alongside her in presence to help her feel like she wasn’t so alone. Her sister was adding strength to her hardship as an ever-present burden-bearer in a way none of the rest of us could. She was inviting herself into Anna’s pain and sorrow. So often people in pain are unable to ask for help because they are so exhausted and consumed with their pain. They’re unable to always let us know what they need. Taking up the ministry of burden-bearing and inviting ourselves into the sacred places of their pain and sorrow helps them to carry the load. God doesn’t desire for us to suffer alone. There are people God places in our lives regularly who we’re called to come alongside and help carry their burden just like Stephanie did for Anna. 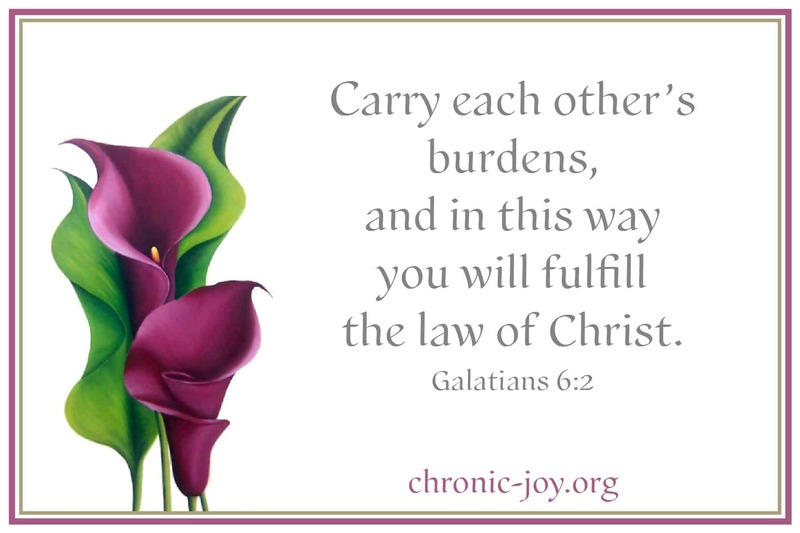 As believers, it’s our great calling to bear one another’s burdens. There is no greater privilege than to be present with another person in pain; no greater gift in tough times than to know we’re not alone. I think of the women who were present at the cross as Jesus hung bearing the weight of the greatest burden–our sin. They couldn’t do anything to change Jesus’ circumstances, to spare Him from His imminent suffering, but they could help bear His burden–by their presenceauthentic love in action. So often because we don’t know what to do for those who are suffering, we don’t do anything. Maybe it’s because we feel uncomfortable or don’t know what to say. The action that Galatians talks about doesn’t always involve doing something like we so often think. We don’t have to force words when many times words are inadequate. Words are not going to reverse what happened, take the pain away, cure an illness, etc. Many times, the most significant thing that you can do is to just be there. When I look back, it was that ministry of being there that helped Anna bear her burden most. No words we could have spoken would have lightened the pain, but not being alone–having someone to just be there next to her in the same room in the bed next to hers– was healing on so many levels. God, in His grace and wisdom, used her sister to reassure her that He had not abandoned her. It’s called the ministry of burden-bearing, and it’s powerful. Being present with others who are suffering is an act of grace. Here’s a case where less is more. We can’t fix their problem, but we can be agents of comfort and encouragement. When God wants to bring a hug to someone, to help them feel His presence, He always sends one of His followers to put His arms around them to help ease their burden. There’s no question that with suffering comes mystery that we can’t understand. But there is one thing that we can understand: when we bear one another’s burdens the heartbreak shared is cut in half. When we love a person enough to help bear his or her burden, God works in amazing ways–healing ways. This year Anna had several more surgeries. I’ll never forget the panic I felt one night when I peeked into Stephanie’s room in the wee hours of the morning only to find her missing. The light was on, but no Stephanie. I ran downstairs searching every room and still no Stephanie. Because I was half asleep, I checked out everything one more time racing all over the house thinking maybe I’m just not seeing her. To my surprise, I finally found her in the last place I looked. On the night Anna came home from the hospital after yet another surgery, there was Stephanie in Anna’s room all snuggled up with her in her bed. Once again she seemed to get what so often we don’t–the ministry of burden-bearing! Burden-bearing can make all the difference in the fight some people are facing. It has the incredible power to bring life and hope and strength and joy at a time when those things can be absent. Sooner or later every one of us is going to be on the stretcher, in need of a burden-bearer. Maybe we’re not at that place right now, but who has God put in front of you whose burdens you need to be bearing? Who needs the ministry of your presence? Whose pain do you need to invite yourself into? Who is your Anna? *First Published in Just Between Us magazine. Shelly has been the editor of Just Between Us magazine for the last 28 years. Additionally, she serves on the Pastoral Leadership Board. She and her husband have four daughters and live in Menomonee Falls, Wis.